Posted on Mon, Apr 2, 2012 : 4:23 p.m.
More than 100 shoppers came to downtown Dexter on Saturday to support local businesses at a “Tornado Relief Cash Mob Crawl” hosted by the Ann Arbor Cash Mob. The event, said local business owner Mary Bowe, drew some of the largest crowds the downtown area has seen in years. 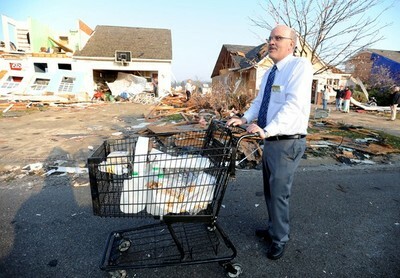 Gary Winters, manager of the Busch's grocery in Dexter, pushed around a cart with donated water after the tornado. The store is one of many businesses that donated to the relief effort. Bowe estimated her store, the Dexter Picture Frame Company, saw a 30 percent increase in sales over a typical Saturday. Founded by Paul Hickman earlier this year, the Ann Arbor Cash Mob is a local movement that plans a monthly spending crawl at local businesses. It asks participants to descend upon one retail store and one restaurant on a specified date to boost local business’ sales. The Ann Arbor Cash Mob has already visited Acme Mercantile, Morgan & York, Encore Records, Jerusalem Garden, Old Town Tavern and Fraser’s Pub. When a tornado swept through the Dexter community on March 15, Hickman said he knew the Cash Mob needed to plan an event in Dexter to support the many business owners that were donating their time and money to relief efforts. But rather than choosing just one or two downtown Dexter businesses, people wanted to support all of them, Hickman said. About 60 participants - from several different communities in Michigan - gathered at the Monument Park gazebo in downtown Dexter at 10 a.m. on Saturday, according to the group’s Facebook page. People continued to filter in and out of downtown businesses throughout the day. Bowe said that aside from the monetary boost the Cash Mob brought her store, it was also great for exposure. Lizzy Alfs is a business reporter for AnnArbor.com. Reach her at 734-623-2584 or email her at lizzyalfs@annarbor.com. Follow her on Twitter at http://twitter.com/lizzyalfs. Tue, Apr 3, 2012 : 3:18 p.m. I love to read good news about good people doing good things!